Make a place for me - please! You prepared your home for your new baby, have you now prepared it for the needs of your young child? Maria Montessori described the classroom as the prepared environment. The home too, if it is to meet the emerging needs of the child, needs to be prepared. If the child is confronted by obstacles and frustrated at every turn is it any wonder toddlers can be cranky? Your child wants and needs to do things by themselves, every non -essential help is a hindrance to the child's development and it demonstrates to the child that the adult is an obstacle rather than a partner on the path toward independence..
To create a home environment which supports the developmental needs of your young child realistic expectations and child friendly time frames are essential along with ordered, age-appropriate physical organisation. Starting with the physical organisation often helps with the rest. 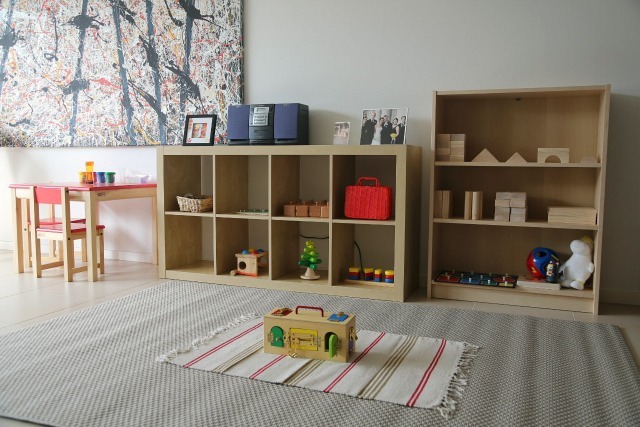 De-cluttering your child's play space/bedroom is a great place to start, it will help you to see more clearly and decide on the next step. Newer PostThe world is a wonderful, beautiful place - help me see it. Older PostThe joy of rain!